24 Top-Quality Spectrum™ Lite Sports Balls! 6 each of volleyballs, basketballs, footballs and soccer balls. Foam outer layers are super soft. 20 to 30% lighter than comparable balls. Easier to grab, catch, throw and kick. 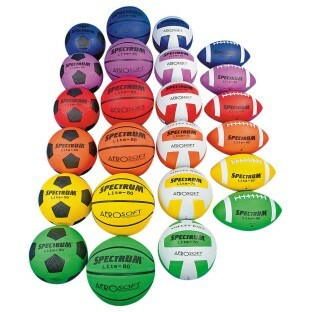 Includes 24 top-quality Spectrum™ Lite Sports Balls, 6 each of volleyballs, basketballs, footballs and soccer balls. Each ball features a foam outer layer making them softer and easier to grab and or catch. 20 to 30% lighter than official weight balls of comparable size, which makes them easier to throw and kick. This intermediate size pack has intermediate size footballs, basketballs, soccer balls (size 4) and official size volleyballs. Ideal for kids age 9 to 13.